Our postgraduate students are a diverse group, including professionals looking to advance their careers and graduates joining our programmes after completing their first degrees. What they have in common is a strong interest in social, economic and environmental issues, and their impact on the future direction of local and global communities. “I chose to pursue urban planning in Auckland because the entire region is on a journey of huge change, and I want to be directly involved in how that change will affect our communities. My university career started in architecture because I wanted to better understand – and help others better understand – the impact of their decisions on the places they live in. As I became more interested in global issues and the collective responsibilities to community, environment and future generations, expanding into urban planning was the next logical step. “The School of Architecture’s focus on urban issues is a strong point of difference in New Zealand. The School is well-connected to the world of practice, and the level of academic and industry experience I have been able to access via the School has been incredibly valuable for building professional networks. In two short years I have worked with iwi, charitable organisations, local government, and in academic research. The quality and diversity of my peers and the studio environment at the School have been key to stimulating discussion, generating ideas and seeding the innovation we want to see in practice. The biggest learnings for me have involved pushing my boundaries: learning to set my sights high but also broadly; that boundless curiosity can cause paralysis or be honed into a valuable professional skill set, depending on how you approach it; and that amazing things happen when you are around people with the same level of enthusiasm. Steph Lam is currently studying for a Master of Urban Planning (MUrbPlan). "I have been interested in studying Architecture for as long as I can remember. Studying at New Zealand’s top ranked university I believe sets me up for a good position later in the New Zealand industry and abroad. I thoroughly enjoyed the hands-on projects, especially the creation of the large-scale installation through Myers Park as part of the 2011 Rugby World Cup Fan Trail. Staff at NICAI are really approachable – their skills and experience provide us with an invaluable source of information. "Travelling to Europe with fellow students on a study tour had me immersed in a variety of architectural projects by European architects. Travelling allowed me to experience architecture firsthand, enhancing my ability to think creatively and visualise how architects have dealt with different constraints and supported the changes in society through time. This degree has taught me to firmly critique my designs, work collaboratively, as well as create designs that are realistic and practical in today’s society. " Herman is currently studying for a Master of Architecture (Professional) (MArch(Prof)). "I was introduced to architecture by a friend who was studying it, and it has interested me ever since. Architecture allows you to deconstruct things, analyse how systems function at different scales and add your perspective to the situation. This results in a remarkable synthesis of creativity and practicality. The University of Auckland provides a great research environment to study the diverse and interesting complexities of Auckland city. The postgraduate programme invites students to question, theorise and provoke conversations about our built environment. 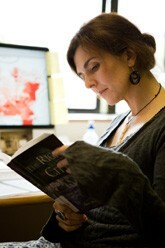 “What I have enjoyed most about the programme is its fluid nature of research. Often, multiple aspects of life are investigated and integrated to further the development of knowledge and application in architecture. As a result, the programme prepares you not just to be an architect, but also to pursue various other career opportunities. 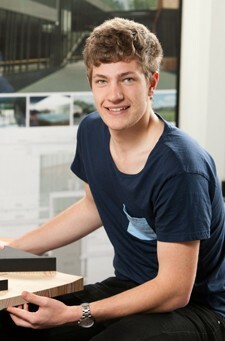 Upon graduation, I hope to travel and gain experience pursuing my interests in architecture." Steven Lin is currently studying for a Master of Architecture (Professional) (MArch(Prof)). “I have always been interested in the environment and how the world is shaped around us. Studying a Master of Urban Planning is a ticket to enhance my knowledge and skills for my new career in urban planning and ultimately give something back to the New Zealand urban environment that I live in. Kelly Slater is currently studying for a Master of Urban Planning (MUrbPlan). “Creative design had always been something I could get obsessed about; I enjoyed it so much that I chose to study architecture. It’s only at an institution like the University of Auckland that you’re exposed to such diverse interests, passions, and people who are really interested in what unique view you have of the world. Being immersed in this environment really pushes you to think about how architecture resonates with you and after every year of the programme, I feel myself grow immensely as a designer and a person. At the University I enjoy that there are no creative limits to whatever you push for and that the support for your work helps extend what you thought was possible. The greatest thing I’ve come to value from my degree is the joy of learning and how every subject matter has the potential to contribute to architecture and society. Angela is currently studying for a Master of Architecture (Professional) (MArch(Prof)). Julie Anne Genter completed her undergraduate study at the University of California (Berkeley), then spent several years in France before moving to New Zealand. She gained a Master of Planning Practice with first class honours from the University of Auckland in 2008, and has focussed on research and solutions in transport economics and urban design throughout her career. She is passionate about sustainable transport, and at the time of filming, was standing for Parliament as a member of the Green Party. She is now one of the 14 Greens in Parliament, who were all elected from the party list. Patrick Loo graduated from the University of Auckland with a Bachelor of Architecture in 2008. Since then he has been working towards professional registration at the prestigious architectural firm Jasmax in Auckland. He has also continued to further his own creative practice in the innovative design collective OH.NO.SUMO, established in Auckland in early 2009 by Patrick and his fellow Architecture students James Pearce, Katherine O'Shaughnessy and Sarosh Mulla. "This isn't the type of degree where you just turn up to classes... We spent a lot of hours talking through ideas, getting feedback and working collaboratively in the studio." "I have always been interested in geography, but as an undergraduate student I studied tourism. After working and travelling in New Zealand and overseas, I became more interested in pursuing a career path that enabled me to incorporate my interest in geography with my new found interests in law, politics and how people shape and are shaped by their surrounding environment. "I was awarded a Summer Scholarship in 2010/2011 to work on a research project that followed on from an assignment I completed in one of the studio papers. The skills I have learned during this programme include learning how to undertake independent research, communicating ideas effectively through sound reasoning, learning how to use Photoshop, learning how to problem-solve in groups and many more!" 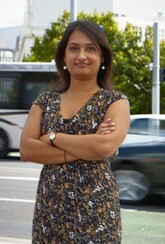 Manini Hallikeri has recently completed a Master of Planning Practice (MPlanPrac). “After completing my undergraduate education in India I decided that I wanted to study abroad to see a different part of the world. I opted for the University of Auckland not only because it is New Zealand’s top university but also because Auckland is internationally renowned as one of the world’s most liveable cities! Namita Kambli is currently studying for a PhD in Urban Design and was the recipient of a University of Auckland International Doctoral Scholarship. "When I started my Master of Planning Practice in 2008 I was hoping to work in the area of environmental policy in local or central government. The degree appealed to me because it gave me a professionally recognised qualification in just two years, and had a combination of taught courses, studio work and research. I finished my MPlanPrac. at the end of last year, and, having discovered that my first love is really research, I’ve come back to start my PhD in Planning. I wouldn’t have committed to another three years here if I didn’t think it was a great place to be. The staff are passionate about their teaching and research, and they make research students feel like part of the community. There’s a lovely camaraderie among the PhD. students, too; I don’t feel isolated, which is a common experience for those writing theses. All going according to plan, I’ll graduate in 2013. I’m not sure where I’ll end up yet – teaching, research, or local government – but I’m going to have some pretty cool options." Emma Fergusson is currently studying for a Doctor of Philosophy (PhD) in Planning.